Regardless of when you undertake the hiking trip it is essential to be aware of the expected weather conditions each day. If your journey is at any time from late autumn to early spring, bear in mind the significantly increased likelihood of unfavorable weather. This can include heavy rain or sleet. Any of these, when coupled with the significantly smaller number of daylight hours, can provide the ingredients for an exceptionally challenging undertaking. Also make sure to plan your daily hiking tour with enough daylight so as not to risk surprise by the dark. A warm and dry hiker is a happy hiker! Therefore comfortable walking/hiking boots and socks, a hat or cap, gloves, fleece jacket, water- & wind-proof jacket and over-trousers are essential outerwear. Beneath that a series of lighter mid- and under-layers of clothing are recommended. As a significant portion of the southern section of the route is along small country roads, lighter walking shoes are a useful additional item to carry. As you are walking in remote partly uninhabited areas, it’s highly recommended to carry lamps, GPS, compass, first aid kit and mobile phone with you. All three countries can be easily reached by plane: Tirana airport (Albania); Podgorica airport (Montenegro) and Pristina airport (Kosovo). Within all three destinations you will easily find local taxi services to bring you to the embarking point of the trail. 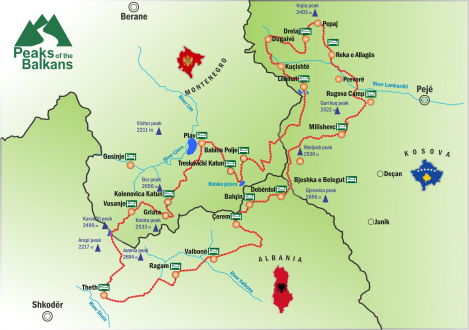 You will also find different types of public transportation, such as minibuses (Albania) or scheduled bus services (Montenegro). Further information can be found in the respective tourist information services. 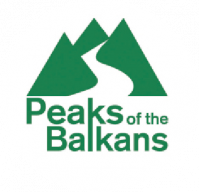 Anyone setting out to walk a long-distance trail such as the “Peaks of the Balkans Trail” is embarking on a serious test of physical endurance. Each stage involves a period of several hours spent outdoors, frequently in isolated and remote locations and from time to time at altitudes of up to 2300 meters. Various factors must therefore be taken into account before departure. Please note that you are hiking at your own risk!